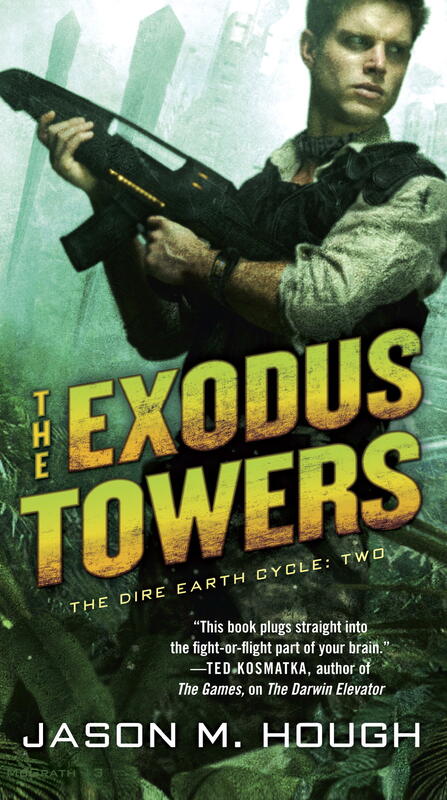 This is the second book in Jason M. Hough’s Dire Earth Cycle, and due to some very important plot points revealed at the end of the first book in the series, The Darwin Elevator, there will be unavoidable spoilers in this review for the first book. 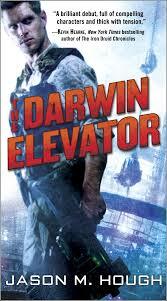 The Darwin Elevator was fun, but it certainly wasn’t my favorite book. Friends of mine kept telling me to give The Exodus Towers a try, that the series got better. And they were right. This second novel is far and away better than the first. The pacing is tighter, the characterization is better, the alien technologies are described better, the stakes are higher, the tension is built in a more effective way, it’s just a much better written book all the way around. At the end of the first book, a second elevator plunged to earth, landing in Belem, Brazil. The stations and levels that escaped the Darwin elevator were able to attach to this new elevator, and since then, Tania Sharma and Skyler Luiken have been slowly but surely building a new colony. Hampered by a low population but helped by mobile towers that protect from the Subs virus, it’s slow going. Skyler spends most of his time on the ground scouting, and Tania is up in the elevator. She takes comfort in group decisions, being cautious with their limited resources, and not taking action until a sure course is decided on. Skyler on the other hand, is comfortable making snap decisions with incomplete information. Tania has lived the protected life of an orbital scientist, where if it takes two weeks to come to a decision it won’t really matter, whereas Skyler is more used to running from Subs and needing to grab scavenged cargo as fast as possible. I enjoyed watching the two of them play off of each other, and I appreciated the time Hough took to really develop their personality differences. So many times, they are both right, or both wrong, and sometimes they even see it. There is some obvious chemistry between the two of them, but Hough keeps their relationship complicated instead of taking the easy route of allowing them an easy or simple romantic relationship. When Skyler Luiken was a kid, a strange alien ship took up residence over the Earth, and plunged a spun thread into the Earth’s surface, creating a space elevator with the original alien ship acting as an anchor at the other end. Suddenly, Darwin, Australia was the most important city on earth, and Neil Platz, owner of the property where the elevator landed, was the richest man in the world. A few years after the elevator landed, the plague hit. Within days, anyone not within the Aura of the Elevator base succumbed to the Subs disease, causing them to devolve to a near animal state. People flocked to Darwin, hoping to escape the disease, or at least slow it down. These days, the area around the elevator base, known as Nightcliff, is a cesspit, and crews of scavengers use ancient shuttles and repurposed airplanes to travel to surrounding unsafe areas to find tools and machinery and metal, anything that can be sold. Soil and water go up the Elevator to the stations, and food and medicine come down. A small handful of people are immune to the Subs disease, including Skyler and the crew of his ship, The Melville. Russell Blackfield rules Nightcliff with an iron fist, playing politics for a seat on the Elevator Council. Yes, there’s plenty of politics in this book too! The plot of The Darwin Elevator is a lot of fun, and it cracks me up that the story’s most implausible aspect one of it’s best features. There is a lot of unexplained alien technology, and “the aliens did it!”, which at first was tough for me to swallow. Props to Hough for extending my suspension of disbelief. Characters for the most part are interesting as well, Skyler isn’t exactly an hero or an anti-hero, he’s just a guy who wants to do his damn job, get his damn paycheck, and pay his crew. He doesn’t want to get involved in anything.